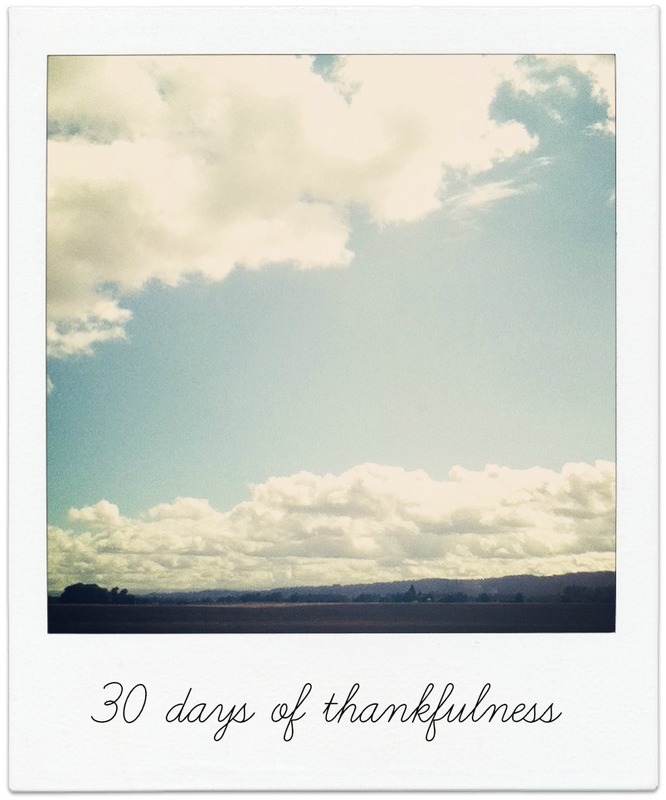 THIRTY DAYS OF THANKFULNESS | WEEK ONE. Being really, and truly grateful. It's easier said than done, right? This time of the year, it seems like gratitude is everywhere. It's on blogs, it's on Pinterest, it's even on Twitter and Instagram. It's hard to truly integrate into our lives 24/7, 365 days a year though, isn't it? The day after Christmas, I often find myself wanting more. Wanting that other Christmas present, that other hairstyle, that other closet. It's why we want everything new in the new year. But, I think it's important to be grateful and being grateful everyday can start now. There's no time like the present and there's no need to start a new goal or habit in January. When I first heard about Angela's new link-up, I wasn't sure I'd be able to participate. But boy, am I glad I am. It's going to be a great chance for me to find those little blessings, count those blessings, and praise God for them, too. Join in on the fun, won't ya? 11/1 Babysitting jobs. Spending time with cute kids--who wouldn't want to do that? Seriously, the kids I watch are some of the easiest kids I've ever had to babysit so it's more than a blessing to be able to watch them play, grow, and learn. 11/2 Thai food + lazy Saturdays. This is what weekends are for, right? Good food and time spent relaxing. Honestly, I haven't appreciated all that weekends are until just recently so I am really and truly thankful for weekends. 11/3 Sunday naps. Enough said. 11/4 Getting out of work early. Coming home before it's dark out was such a nice change. It also meant I came home a little earlier to get caught up on some blog-reading, too! 11/5 Speaking Spanish with kids. I haven't taken Spanish since my senior year in high school so I'm a little rusty, but fortunately God's blessed me with the ability to pick up a little and be able to talk to some of the kids in my class. 11/6 Field trips with kids. They're exhausting (I've never done so many frantic headcounts before!) but the kids loved them and I loved seeing their excitement. 11/7 Quiet mornings. Getting the chance to read a few blogs, pin a few pins, and watch a little morning news is the perfect start to my day. I may have to wake up a little earlier, but it's all worth it in the end. What are you grateful for? Be sure to link up with the always lovely Angela and check out what other bloggers are grateful for this week, too! So sweet I love your list. Most of all I too am thankful for quiet mornings and naps on Sundays!!! Man just thinking about makes me want to take a nap!! Hehe! Yayyy! So glad you could participate! I am also loving Thai food--always! :) And I am super impressed you are still able to whip out that high school Spanish--I'm not sure I could! Oh, my Spanish is definitely rusty. Like reallly. But listening to the kids talk in Spanish has actually really help bring it back so I'm mostly talking in present tense with common verbs--nothing too complicated or anything! Fortunately, that's all that I've really needed right now! It's so good to write down the things we're thankful for. And I think the more we try to find things to be thankful for, the more joy we'll have in our lives, and we'll be thankful for everything. Call me philosophical. Ha! I just had Thai food today! Yumm. so good! Thai food is definitely the best! And I'm a little jealous now that you had some today and I didn't. :) And I just saw that you and Erin are also co-hosting a gratitude link-up--I guess great minds think alike! lazy Saturdays are the best :) I am so glad you are doing this too! Me, too! I think it was a brilliant idea and I'm so excited to read yours as well! Um, YES to thai food! And I love that 3 out of 7 of these are kids-focused :) Adorbs. And yes, oh, yeessss to sunday naps!! My favorite! Thai food is a-mazing, right? We so need to eat Thai food together sometime, girl! And Sunday naps are definitely the best. It's funny because I never plan on taking a nap on Sunday it just somehow happens each week--especially with work during the week and helping out at church, too. Let's just say I'm already looking forward to this Sunday's nap! I love this! Im glad to see your thankful for Spanish, I take for granted that Im fluent. Im thankful for the reminder. Thx! Blessings.